Some interesting ideas and apps have been created using smartphone cameras – some more creative and intriguing than others. 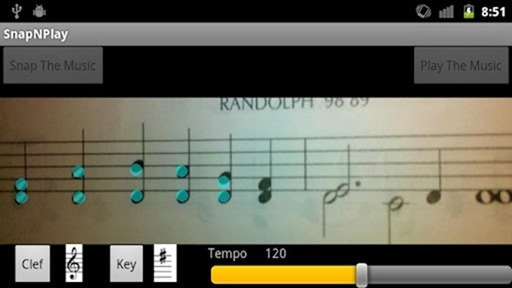 Ranking up there with those utilities which allow words and sentences captured via the camera lens to be translated on-the-fly, SnapNPlay for Android allows you to take pictures of sheet music, and then plays that piece back to you. Based on an optical music recognition algorithm written by the developer, it does a much better job than one would perhaps expect from such an app. 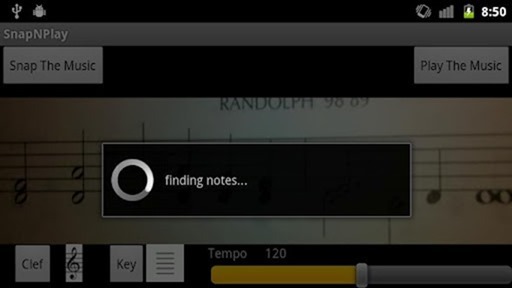 It has been created to detect the language of musical notes written on paper, although can also pick up music from a computer screen. As you can guess, the brighter the environment and surroundings, the better the app will perform, thus the likelier you are to get a perfect transfer from paper to your Android device. Similarly, you’re at an advantage if your device’s camera happens to be one of the sharper snappers on the market. It’s by no means the finished article. At the moment, it doesn’t attempt to parse rests, grace notes, nor triplets, and it can often erroneously flag a non-note glyph as an actual note. Nonetheless, it works well for what is a version 1.0, and the developer has promised to work hard on improving SnapNPlay in order to make it more complete in future versions. It can deal with slanted shots, and those taken in dim lighting with the flash (that is, of course, if your camera has a flash), but it is always recommended you try to capture the image as clearly and correctly as possible, affording you the best and most accurate possible outcome. The full version is $3.99, although there is also a demo version you can test drive before making the purchase. If you enjoy playing instruments, or just simply take pleasure in listening to the ambient sounds that can be created by them, then SnapNPlay could well be the app for you. If you’ve no idea of how to read music, but like the idea of learning, then this app could also be your ticket to a fluent understanding.